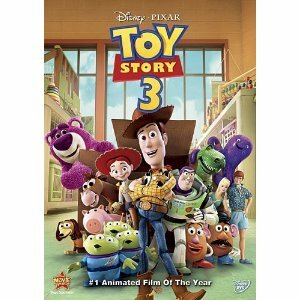 Join us for popcorn and a movie at 3 p.m. this Thursday, December 30th. It doesn't seem possible to me, but it really is almost 2011! The Library will be closed Friday, December 31st, and Saturday, January 1st, for the New Years holiday, and will reopen at 2 p.m. on Sunday, January 2nd. Our Friends group met yesterday and it was announced that they sold $522.40 at their Holiday Bake Sale, another all-time record! Thanks to Shirley Patchett and her wonderful crew of bakers, wrappers, and sellers. Thanks, too, for all the buyers who braved the snow to come out and support the Friends. We're grateful to all of you. The Library will be closed Friday, December 24th, through Sunday, December 26th, for the Christmas holiday. We will reopen at 10 a.m. on Monday, December 27th. While we're closed, you'll still be able to access your OWWL account to renew materials and place holds. 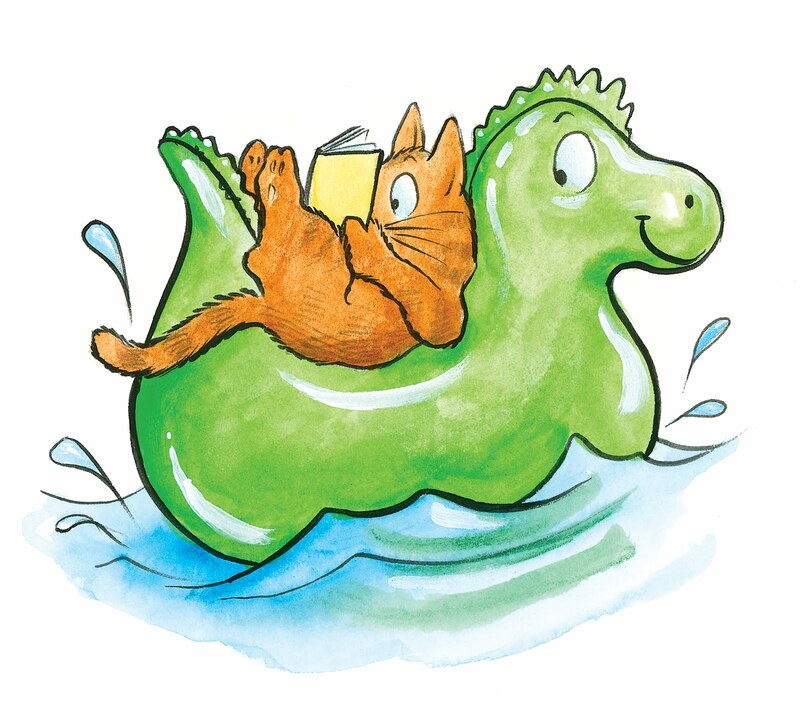 OWWL2go is also always available for downloading audiobooks and ebooks. We're open today, hopefully from 10 a.m. until 8 p.m. Be aware through these winter months that if the Sodus Central School District is closed due to blizzard conditions, we are also closed. When conditions worsen during a day we're open and the roads become unsafe, we may occasionally close early, for your safety and ours. This happens only rarely. Anytime that you're uncertain about whether or not we're open, just give us a call (483-9292) before you head out to the Library. The Library will be closed today, December 14th, due to the winter storm. It's too dangerous for you or for us to be out there on the roads, so please stay in where it's safe and warm. No fines will be assessed today, but if you would like to renew anything that you have checked out, you may do so by leaving a message on our phone (483-9292) or by accessing your OWWL account online. If the weather improves, we will reopen at 10 a.m. tomorrow morning. Click on the book bag to link to the list of DVDs we've added this month. 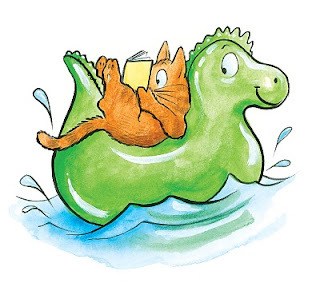 Time-saving tip: If you subscribe to the bookbag via RSS, the list seems to download considerably faster, plus you'll be notified as new titles are added. 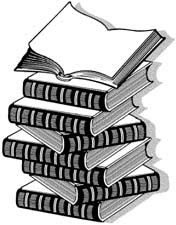 The Sodus Community Library Board of Trustees will meet at 4:15 p.m. this Thursday, December 9th. Board meetings are held the second Thursday of each month, and are open to the public. Because the Friends Bake Sale will be underway in our meeting room, this month's meeting will be held in the Ruth Mills Room. Making book bags (virtual, not fabric!) is one of the capabilities of our new Evergreen software. Click here to connect to my book bag of DVDs that we've added to our collection this month. If you see something you'd like to watch, just follow the links to place a hold. You may also call us and we'll place it for you. Enjoy! The Library will close at 5 p.m. on Wednesday, November 24th, and remain closed Thursday and Friday, November 25th and 26th. We will reopen at 10 a.m. on Saturday, November 27th. Closing does not affect access to your OWWL account, our catalog, or OWWL2go. The Library's Board of Trustees' monthly meeting will be held at 4:15 p.m. on Thursday, November 18th, in the Library's meeting room. Board meetings are open to the public. Our Friends group will hold their monthly meeting at 1:30 p.m. this Tuesday, November 16th. The Book Club will meet at noon on Thursday, November 18th, to discuss The 19th Wife by David Ebershoff. Our Stitchclique group will gather at 10 a.m. on Friday, November 19th. Even if you've never been to any meetings of these groups, we'd love to have you join us. Reservations are not required - just come and enjoy! Have you seen the great icon on Google's homepage today? It's in celebration of Robert Louis Stevenson's 160th birthday. Click here for more information. "The difficulty of literature is not to write, but to write what you mean." 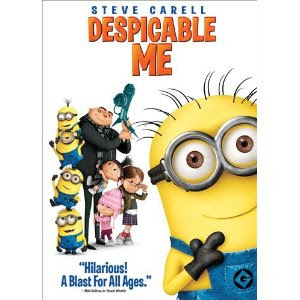 Join us at 3 p.m. on Friday, November 12th, for popcorn and a movie. "We often take for granted the very things that most deserve our gratitude." The Library will be closed Thursday, November 11th, in honor of Veterans Day. As always, you will be able to access your account to place holds and renew materials, search our catalog, and access/check out OWWL2go downloadable titles. This is a glimpse of the sale room which has been set aside for children's books. Don't miss the final two days of our sale. With the exception of a few individually priced items, everything that has not been sold will be up for grabs at $2/bag. Sale hours on Saturday are 10 a.m. until 5 p.m.; Sunday hours are 2 until 5 p.m.
We are so pleased to be able to hold our Friends annual used book sale in the Library's new Annex. This photo shows one of the five rooms our Friends have filled with books. You can see Shirley, Elinor, and Sharron making one final check and taking one last deep breath before opening the sale to some very enthusiastic shoppers. While we had a record-breaking first day, there are lots of great titles still available. Books are half-price on Friday, so set aside some time between 10 a.m. and 5 p.m. to stop by and pick up some bargains. You no longer have to use your library card number to log in to our catalog or your OWWL account. You are now able to replace that number with a username. Click on "My Account" and enter your library barcode number and current password, then click on "Login." In the Account Summary which opened up, click "Change" opposite "Username." Enter the username you want to use (Note: the username is case sensitive). Click "Submit," then click "OK." You can now login at any time with your new username. You may also change your password in the same manner. If you have any problems with this procedure or any questions about our new OWWL catalog, please call 483-9292 or drop me an email. Exercise your right to vote on Tuesday, November 2nd. Click here for a sample ballot for your town, courtesy of the Wayne County Board of Elections. Polls will be open from 6 a.m. until 9 p.m.
Have you had a chance to search our new OWWL catalog? The "Home" page now gives you the capability of typing in a keyword, title, author, subject, or series. You can then choose the format you want: books, large print, audiobooks, video recordings, music, or electronic resources. You can limit your search to our library or include all 42 libraries, gain access to your account, or move to an advanced search page (more about that another day). I hope you've set aside time to visit this year's Used Book Sale. Sponsored by the Friends of the Sodus Community Library, this year's sale will be in the Library's Annex at 19 Maple Avenue. We've been amazed by the number of books you've generously donated this year, and are in the process of sorting approximately 10,000 titles! This should definitely prove to be our best sale ever. Your shopping experience will also be much improved. Rather than searching through our cramped meeting room, you'll be able to browse through several rooms which will be set up according to genre. A special treat will be the children's area in one of the front rooms. Sale hours will be 10 a.m.-8 p.m. on Thursday, November 4th, 10 a.m.-5 p.m. on Friday and Saturday, November 5th and 6th, and 2-5 p.m. on Sunday, November 7th. 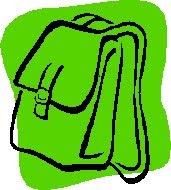 Prices remain as they were at last year's sale: $1/book ($.50 in the children's room) on Thursday, everything half price on Friday, and $2 for whatever you can fit in one of our bags on Saturday and Sunday. Parking is available behind the Library, behind the Annex, on the street (Maple Avenue or Smith Street), and in the public parking lot just south of Poppy's Pizza. See you there! We've received our new issue of Library Journal, and I'm proud to say that our library has again been named a 4-star library! Based on 2008 data submitted by 7,407 public libraries to their respective States, LJ has named 258 starred libraries, assigning 3 to 5 stars to each. To read the entire article, click here or on the new America's Star Libraries logo. The Library's Board of Trustees will hold their monthly meeting at 4:15 p.m. on Thursday, October 14th, in the Library's meeting room. Board meetings are open to the public. The Library will be closed on Monday, October 11th, in honor of Columbus Day. 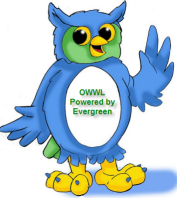 You will still be able to access your OWWL account, plus download audiobooks and ebooks at OWWL2go. We will delay opening until 1 p.m.
We're Going Green - Evergreen! Over the years, there have been many changes in the way we find the titles you want and how we check them out to you. We've gone from doing everything by hand, to stamping those cards with the little metal tabs, on to a stand-alone computerized system, and, most recently, to the integrated OWWL system that includes all 42 libraries in Ontario, Wayne, Wyoming, and Livingston Counties. Each step has enabled us to serve you better and opened up new ways for you to use the library. The next step is just around the corner! We are in the process of moving to Evergreen, an open-source software that will offer us more flexibility, greater efficiency and better cost control, while introducing new and exciting features for you. To complete the transition, we will be operating "offline" on October 4th, 5th, and 6th. For those three days, the catalog won't be available for searching, renewing, or placing holds, nor will we be receiving holds in delivery. We will be open our regular hours, from 10 a.m. to 8 p.m. those days, and will be able to check items out to you. While we encourage you to always bring your library card with you, it will be required those three days, as it won't be possible to search our database for your information. October 7th is "Evergreen Live Day" for all 42 libraries. Because there will be some procedures to work through that morning, we'll delay opening until 1 p.m. We appreciate your patience as we take this new leap forward in our commitment to provide you with the best service available. Stop by to pick up a brochure which details some of the improvements you'll see as we go Evergreen. We're celebrating our freedom to read as Banned Books Week starts today. 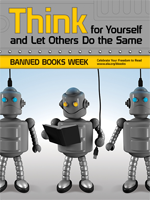 Click here or on the robot for more information about the Week, and check out our display of books that have been challenged and/or banned in the past year. 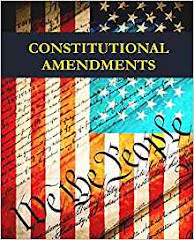 We also have handouts listing the top 100 most frequently challenged books in the last decade - I think several of the titles will surprise you. While you may not feel that a title is of interest to you or even appropriate for your family, I hope that you support others in their reading choices, whatever they may be. The Book Club's September 30th meeting has been canceled. Our discussion of The 19th Wife will be held at a future date not yet determined. 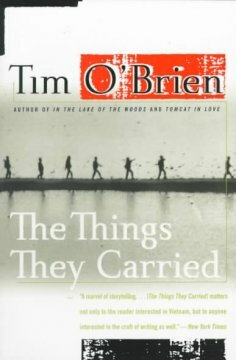 Because Writers & Books' upcoming "Big Read" will feature The Things They Carried by Tim O'Brien, we are reading that next, discussing it at our October 28th meeting. Click here for more information about the book and the W&B events that are planned. Join us at noon on Tuesday, September 21st, for a Books-Sandwiched-In luncheon featuring popular Sun & Record columnist, Chris Kenyon. 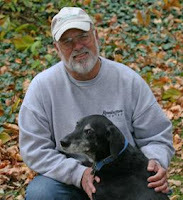 Chris will share slides of some of the beautiful outdoor spots Wayne County offers. The signup sheet is filling up fast, so either stop by the Library or give us a call at 483-9292 to reserve your spot. A delicious lunch and a great program, all for $3 - our Friends group provides one of the best deals you'll find in Sodus. Enjoy the luncheon and stay for the Friends meeting, following at 1:30. We'd love to have you join us! It's been a great Summer, but Fall also brings interesting times at the Library. Our Book Club will resume meeting at noon on Thursday, September 30th, to discuss The 19th Wife by David Eberschoff. Feel free to bring your lunch with you. We are an informal, fun group, and look forward to having you join us for an interesting discussion. The monthly meeting of the Sodus Community Library Board of Trustees will be held at 4:15 p.m. this Thursday, September 9th, in the Library's meeting room. Board meetings are open to the public. The Library will be closed Saturday, Sunday, and Monday for the Labor Day weekend. We'll reopen at 10 a.m. on Tuesday, September 7th. 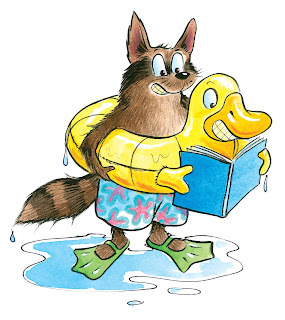 As always, our OWWL catalog and OWWL2go downloadable audiobooks and ebooks are available 24/7. 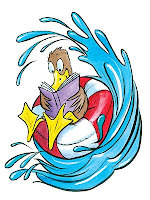 Did you have fun reading with us this Summer? We all had a great time! I'd really appreciate it if you would each write one comment about this year's Summer Reading and leave it at the library desk. You can continue to add minutes online until midnight on Saturday, August 21st. You then have until August 31st to turn in your remaining Time Trackers and completed Bingo sheets. We'll add those final Tracker minutes to your totals and have the drawing for the Family Fun Pack on September 1st. Good luck! 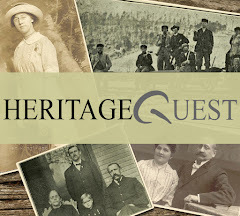 This finale program is made possible with partial funding from Federal Library Services and Technology Act funds awarded to the New York State Library by the Federal Institute of Museum and Library Services. 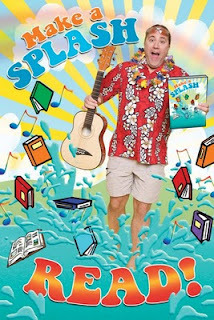 Note: Andy's musical performance is open to everyone, not just Summer Reading participants. I hope you will be joining us at 2 p.m. tomorrow, August 15th, for a great Friends event. We'll be recognizing authors who have lived or are currently living in Sodus. Books and articles will be on display, and some of the authors will have copies of their works for sale. Refreshments will be served immediately following the recognition. 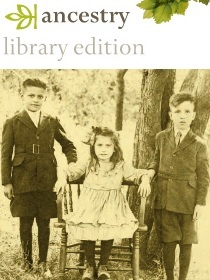 The entire event will take place in the Library's Annex at 19 Maple Avenue. See you there! Monday, August 9 - Story Hour *, 10:45-11:30 a.m.
Tuesday, August 10 - Share-a-Book Reading Club ***, 1:30-2:30 p.m.
Thursday, August 12 - Fun Club **, 1:30-2:30 p.m.
Friday, August 13 - Game Day **all**, 1:30-3 p.m.
Are you keeping track of the minutes you read? Remember, all the names on the Time Trackers, including those you enter online, will be put into the drawing for our Family Fun Pack. You want to be sure your name is in the bowl. So far, our 7th-9th grade group is ahead with 7,622 minutes recorded, with the 4th-6th graders gaining on them with 5,652 minutes read. There is still time for the preschool-Kindergarteners, with 2,745 minutes and the 1st-3rd graders with 3,905. Parents of these younger groups, bring in those Time Trackers so we can record your minutes! The monthly meeting of the Sodus Community Library Board of Trustees will be held at 4:15 p.m. this Thursday, August 12th, in the Library's meeting room. Board meetings are open to the public. 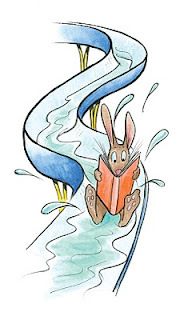 Monday, August 2 - Story Hour*, 10:45-11:30 a.m.
Monday, August 2 - Rock Painting****, 1:30-2:30 p.m.
Tuesday, August 3 - Share-a-Book Reading Club***, 1:30-2:30 p.m.
Wednesday, August 4 - PJ Storytime *&**, 7-7:30 p.m.
Thursday, August 5 - Fun Club**, 1:30-2:30 p.m.
Friday, August 6 - Movie Day (Diary of a Wimpy Kid) **all**, 1:30-3 p.m. There will be a special meeting of the Sodus Community Library Board of Trustees at 3:30 p.m. this Thursday, July 29th, to discuss our expansion project. Board meetings are open to the public. 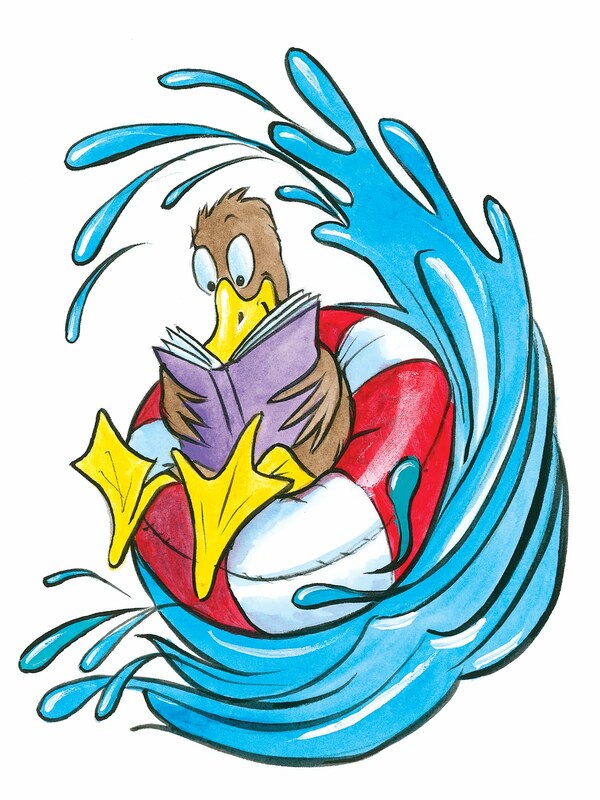 Monday, July 26 - Story Hour *, 10:45-11:30 a.m.
Monday, July 26 - Rock Painting ****, 1:30-2:30 p.m.
Tuesday, July 27 - Cap'n Dave's Magic Show (David Moreland) **all**, 4-4:45 p.m.
Thursday, July 28 - Fun Club **, 1:30-2:30 p.m.
Friday, July 29 - Movie Day (Toy Story 1) **all**, 1:30-3 p.m. I hope you've put Cap'n Dave's Magic Show on your family's calendar! David Moreland, who has appeared in movies and on television, including both Seinfeld and Becker, will "Make a Splash" at 4 p.m. on Tuesday, July 27th. His not-to-be-missed show blends magic, mystery, comedy, audience participation, and puppetry, and is sure to be a high point of the Summer. Each child who attends will receive a free bookmark, learn a magic trick, and have a chance to win a Moreland the Magician Magic Set. The last time David performed for us, we had standing room only, so you may want to arrive a bit early! Monday, July 19 - Story Hour *, 10:45-11:30 a.m.
Monday, July 19 - Rock Painting ****, 1:30-2:30 p.m.
Tuesday, July 20 - Share-a-Book Reading Club ***, 1:30-2:30 p.m.
Wednesday, July 21 - PJ Storytime *&**, 7-7:30 p.m.
Thursday, July 22 - Bubble Day **all**, 1:30-2:30 p.m.
Friday, July 23 - Fishy Rock Painting ***, 1:30-2:30 p.m.
Due to a licensing problem concerning Percy Jackson & The Olympians: The Lightning Thief, we won't be able to show it Friday afternoon. We hope to be able to show the film at a later date, and apologize for the disappointment. 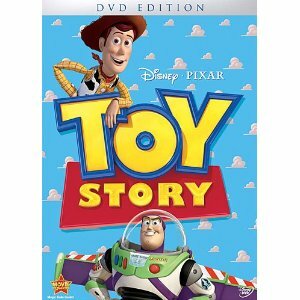 We'll be substituting Disney's Space Buddies, so plan on joining us for the fun. The case says it is "One small step for Dog, one giant leap for Dogkind!" Monday, July 12 - Story Hour*, 10:45-11:30 a.m.
Monday, July 12 - Rock Painting****, 1:30-2:30 p.m.
Tuesday, July 13 - Share-a-Book Reading Club***, 1:30-2:30 p.m.
Thursday, July 15 - Fun Club**, 1:30-2:30 p.m.
Friday, July 16 - Movie Day (Percy Jackson & The Olympians) **all**, 1:30-3:30 p.m.
Make A Splash @ Your Library! 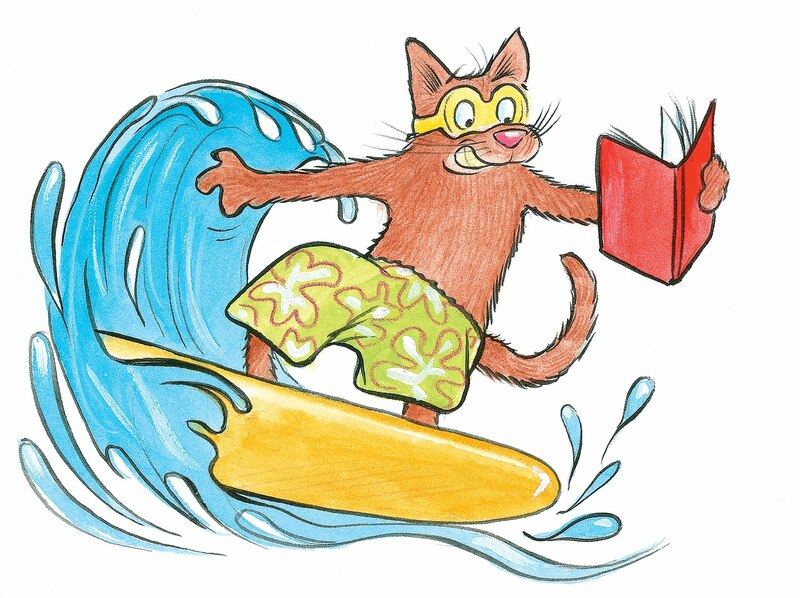 Register now for six weeks of Summer Reading fun. 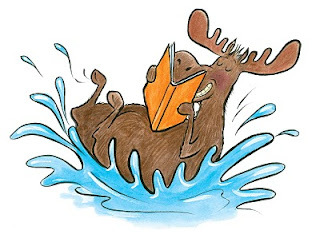 We have reading clubs and programs for all ages, and this year you can register, keep track of your participation, and share your thoughts about what you read - all online. Register today, and start tracking your reading next Sunday, July 11th.